How long would it take for a mouse to evolve into an elephant? 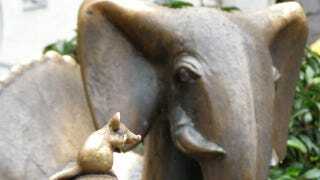 We're used to mice being small and elephants being big, but there's no reason they will stay that way forever. Elephants could become pipsqueaks and mice could get mammoth... and one of those will happen much faster than the other. Alistair Evans of Australia's Monash University assembled a team of twenty biologists and paleontologists with one goal: to figure out how the sizes of species evolve over millions of years. The fossil record shows us how all sorts of different mammals exploded in size after the dinosaurs went extinct, and we can use that evidence to figure out how fast these originally pint-sized mammals turned into megafauna. They found that mice really could evolve to be the size of elephants - it's just going to take them 24 million generations to do it. Considering mice start breeding at roughly six weeks and elephants begin mating around the age of 20, that means it should taken anywhere from 2.8 to 480 million years to produce elephant-sized mice...assuming you start right now, of course. According to the researchers, it's a bit easier to get larger animals to elephant size. Rabbits, for instance, would only need about 5 to 10 million generations, while sheep could get there in a downright speedy 1.6 million generations. To really speed up the growth process, you're going to want to start throwing animals into water (note: you probably shouldn't actually do this), as marine mammals like whales increase in size at twice the rate of their land counterparts. Co-author Dr. Erich Fitzgerald suggests that's because the water helps support a lot of weight, allowing for the evolution of much larger species in a much shorter space of time. While it takes a long time for species to get bigger, they can get small again in no time at all. Normal elephants have evolved into dwarf elephant species in just 100,000 generations. This was mainly a result of what's known as island dwarfing, in which a population gets cut off from the mainland. This isolation gives species an evolutionary incentive to consume less food and reproduce faster, both of which are accomplished by becoming smaller. We've seen examples of this is mammoths, hippos, and, yes, hominids. All this leaves me with one lingering philosophical conundrum — if mice did evolve into the size of elephants, would they be scared of themselves? I guess I'll have an answer for you all in 24 million generations. Via PNAS. Image by teclasorg on Flickr.